Upper Sheringham postmill was first built in 1575 as an open trestle mill and was probably rebuilt on more than one occasion during its working life. 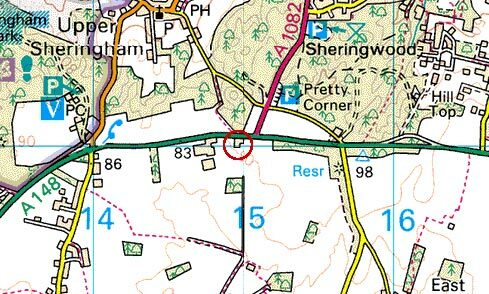 Early maps show the mill as Sheringham Mill, which occupied the second highest site of any windmill in Norfolk. It was only a few feet lower than Briningham Smockmill. "which Mills and Buildings I have the power of removing and disposing of"
Subject to Mortgage of £70. Tenement, windmill and lands in Sheringham and East Beckham leased by Ashe Windham to William Tower for 21 yrs in 1710; with articles of agreement, 1709, and schedule of mill gear. 1741 ... Rice occurs. He commenced a suit against Joseph Priest the miller for tithes, although Priest said that he never paid any. The Rev. Patrick St. Clair interested himself on behalf of Priest and Mr. Rice agreed that the matter should be settled by Mr. St. Clair and another clergyman.